I love to see Spring flowers, but I like to hear Spring thunder even more…KABOOM!! Thunder is one of the true highlights of the season, and it happens to be part of your high calling in Christ. Did you know thunder is basically a sonic boom? 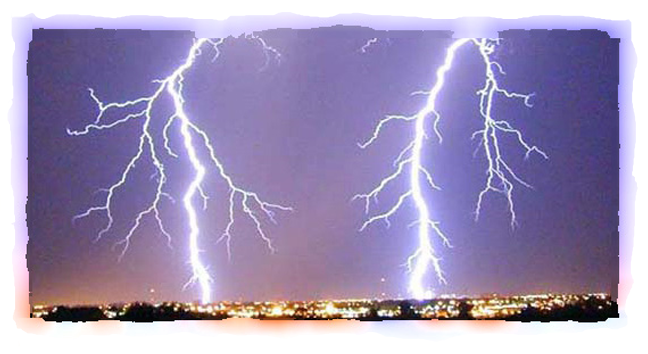 When warm and cold weather fronts collide their friction creates electricity so intense it causes a sizzling hot flash (lightning) that pushes the surrounding air so fast – faster than sound can travel at about 767 mph – it breaks the sound barrier, creating the CRACK or BOOM we call thunder. Thunder is born from conflict, from hot and cold. Without conflict you get no electricity, no lightning bolts, no thunder claps. As a California native I grew up watching storms roll in from the Pacific, lazily approaching land with little or no Hollywood sizzle – often dropping nothing more than drizzle. More like a boring monologue than award-winning dialogue. When I went to college back East storms arrived much more frequently – and usually more violently – coming as they often did off the angry Atlantic Ocean. But they didn’t produce many sonic booms. Not enough hot and cold conflict in the heavens above, apparently. But when I arrived in Dallas I finally witnessed the dazzling drama of a good Spring thunderstorm as frigid air from the upper Midwest (and Arctic territories beyond) would race southward toward warm tropical air masses rising from the Gulf of Mexico – sometimes dropping ground temperatures from 68 to 38 in just an hour on the way – where the two fronts would clash like titans and electrify the skies with daggers of light and thunderous sounds so loud you instinctively cover your ears and run for cover…KABOOM!! I was so thrilled I’d drive to the top of our office’s parking structure to just sit and watch the show, always loving the kettle-drum soundtrack most of all. Did he call them that to recognize and applaud their boldness, or did he intend to impart boldness upon them (or call it forth from within them), prophetically? We can only speculate because we don’t know much about the brothers at that point. They were fishermen, apparently of some financial means. James would be the first of the 12 disciples to perish for his faith, while John became a spiritual leader and gospel writer in the early church and is the only disciple to avoid martyrdom. The important thing in my book (yes, I’m currently writing a book for men called Sons of Thunder) is that Jesus in all his parable-spinning, heavenly-yet-down-to-earth genius chose to reference thunder so profoundly. He knew (and knows!) better than anyone the dynamics of thunder in the atmosphere. He understood the conflict between his kingdom and the world’s system, and how his followers would be called into the crucible to advance one against the other. I think he also understood the need for his followers to be bold beyond measure. When I recall Franklin King, my first pro football roommate and the first born-again believer I had met, I’m reminded of his boldness. He didn’t try to win me over with his charm or loving example, though he had some of both. No, he told me I needed Jesus! Even though I seemed to have everything going for me, he knew my real condition and he loved me enough to reach across the divide where fear of man or fear of rejection so frequently extinguishes faith, and tell me the God’s honest truth. He rocked my world like a thunder clap eight feet from my ear. KABOOM!! I’m convinced we’re in a spiritual season today that calls and requires us to be sons and daughters of thunder, filled with greater boldness than we’ve ever known, to reach the people God puts in front of us. People who don’t need politeness or political correctness so much as they need our increased boldness. Thank you heavenly Father for giving us this day and giving us your beloved Son and Spirit. We’re so glad you rescued us from the domain of darkness and transferred us into your kingdom of light. Fill us with boldness, we pray, to overcome fear and reach people with your truth and love, to rock their world for eternity’s sake. In Jesus’ name, amen! John, this essay is fantastic. Being a Midwesterner growing up on the shore of Lake Michigan, I have experienced myriad storms and even a tornado and waterspout. Your message rings clear to me, as my devotion to the mystery of The Trinity has never left me since I was a child serving the Mass at the Alter of God. It also evokes a strong globe-encompassing message that Jimi Hendrix sang about on the title track to his third album “Axis: Bold as Love”. He too recognized the need to proclaim Love for all humanity through a Boldness that indeed, through the artistry of his Guitar, became thunderous in it’s genuineness and urgency. A God given gift and a message of Love.Thanks for these words at a time when I needed to hear them. Regards, Paul “Power-Heck” Powers. Great to hear from you, Paul, and get a dose of your unique perspective! I love it. Artistry, boldness and love. What a potent mix! Keep rocking your world, brother. In his love, JP.